Versatile Mid-Century Modern design comprised of three interlocking components that click together with no exposed wires. The base has a clean, geometric box form and a two position switch which allows for two brightness settings. The arm tilts, the shade rotates, and the shade can be mounted on the arm in either direction. On a desk or table, the lamp illuminates the work surface with a clean, halogen light. Alternatively, the lamp can be mounted on a wall for use as a picture light or articulated sconce. No significant or structural flaws. All original, good working order. 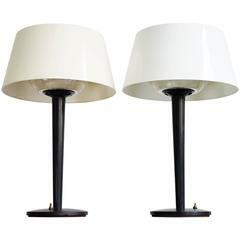 Shade has a small crack (see photo) that is inconspicuous and does not affect the function of the lamp. Minor surface wear as pictured: scuffs, scratches, rubbed edges. Founded in 1904 in New York and family-operated through most of its history, Lightolier was one of the pioneering American electric lighting companies, best known for its embrace of stylistic and technical innovations. Collectors focus on lighting fixtures produced from the 1950s and into the Seventies, when an in-house design team led by Gerald Thurston—and a stellar cast of international design contributors—created an array of practical yet aesthetically lively table and floor lamps, sconces and chandeliers. Amidst the post-World War II building boom, Lightolier—the name combines “light” and “chandelier”—aggressively boosted its residential lighting division. Thurston, who was strongly influenced by the sleek designs of Gino Sarfatti and his Italian lighting firm Arteluce, towards simpler lamp designs that offered flexibility of function. His best-known designs include the “Cricket” task light—a lamp with an adjustable enameled metal hood that toggles on a slender bent-metal base—and the three-legged “Tripod” table and floor lamps. At the same time, Thurston had a wonderful eye for talent and sought work from some of the lesser-known greats of the era, such as Paavo Tynell, the Finnish lighting designer, who designed several brass chandeliers for Lightolier with his trademark elegant flamboyance. And more, Thurston recognized abilities in designers not known for their work in lighting. Edward Wormley, head of furniture design for Dunbar, produced several noteworthy chandeliers employing canisters and reflective hoods. Alvin Lustig was famed as a graphic designer. His ca. 1953 “Ring” ceiling fixture for Lightolier had a minimalist techno look some 30 years ahead of its time. But this was par. Designed by Michael Lax in 1964, the “Lytegem” high-intensity lamp—included in the permanent collection of the Museum of Modern Art—features a ball-shaped shade attached with a chromed armature to a cubic base, a form that would be widely copied in the following decade. Chandeliers designed in the early Seventies by Gaetano Sciolari, with details such as acrylic diffusers and vertical, two-bulb arms, would define the look of lighting in their day. A look through these pages reveals just how astonishingly wide a range of lighting pieces Lightolier produced. The company never flicked off its stylistic switch. Classic Mid-Century American design. Original plastic shades with top louvres and bottom diffusers emit a lovely, warm glow. The table lamp can be converted to a wall lamp by turning the wall part, see the Pictures down below. Original condition. Pinocchio, table or wall mount lamp designed by H. Busquet, circa 1950. Manufactured by Hala Zeist, Netherlands, circa 1950. Adjustable metal tripod base, vibrant red lacquered shade. Original first edition old Pistillo lamp with stunning patina, ceiling or wall lamp in chromed plastic by studio Tetrarch for Valenti Luce, 1970s.